Talk about a brutal day. After all the talk of a market comeback yesterday, I was expecting weakness today, but nothing like this. In fact, I was so confident that the morning dip would be the low point, I bought CROX and covered my MS short (I’ll post the trades later tonight). Ouch! Just as talk of a roaring market comeback was premature earlier this week, it’s too early to go into full bear-mode. Take a look at this chart of SPY (S&P 500 ETF). 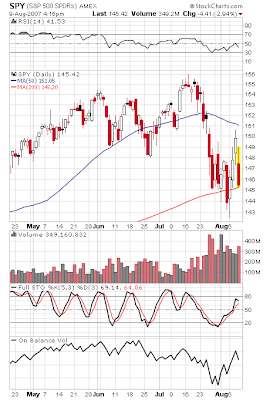 While price made a high percentage move to the downside, SPY is still holding the 200 day moving average that it crossed over earlier this week. If you take the “cup half full” approach, that’s a good sign. A break of the moving average would have been an obvious short signal. Volume is a bit more complicated. A bull can say volume is lighter than last week’s slide, so all is good. A bear can say volume is heavier than this week’s upmove, and he too would be correct. It’s a tough call that I am not prepared to make, so I’m going to focus on price action until volume settles itself. The main point to take away from the chart is we dont’ yet know if today was the end of the market bounce. Until we get a break of the 200 day moving average, I would not make any big bearish *market* bets (there are some individual stocks and sectors that are ripe for shorts). Do you have any thoughts on VSEC? Down significantly today, although up after hours.Not a short guy but have been watching SRS and SKF closely. Any insight would be greatly appreciated. Russell,I’ll post about these stocks tomorrow. I think VSEC and SRS would be good short plays on low volume retracements to resistance. Great eye!